Blurb: LOVE! Beautiful setting, beautiful characters, beautiful book. Review: I LOVED this book! Thanks so much to Megan for being such a big fan and getting me to read it. First of all, what I ADORED was the setting. I loved how everything in Ai Ling's world balanced on the tip of "normal" and magical. She would only occasionally see creatures that we would think of as "fantastic" and sometimes she reacted calmly, and other times it was clearly a shock. It really made me want to dive into this world and discover its secrets. Is magic common? What kind of creatures roam the land? And a map! I need a map! You know I love a setting if I need a map. The only things I strugged with were names. They were all like Ai Ling, Li Rong, Wai Pen, etc. I actually can't tell you from memory what the love interest's name was because my brain just couldn't wrap itself around that kind of names. Doesn't mean I didn't like it; it just confused me. Even though I couldn't grasp their names, the characters in this book were GREAT! I found the romantic and friendship relationships completely authentic. I really was invested in these characters. When bad things happened to them my heart broke. When marvelous things happened, I felt my eyes widen in wonder. I loved them! It was them interacting with that wonderful setting that made this book truly amazing. My ONLY complaint is that it seemed to go by really fast. Every time we're introduced to something fantastic we only see it for a few pages, then the characters move on! TAKE A MINUTE! Yes, I know that monster is trying to kill you, but can you just hold still a minute so I can examine it? There was one time where these "worm demons" attack and they were only there for like, two pages! The characters were like "oh, run away!" And then when they escaped they simply said "those were worm demons," and moved on. I WANT TO KNOW MORE! Seriously. If I could have had an illustrated encyclopedia of all things Xia I would be happy. As a note: there is A LOT of sexual content in this book. At least, a lot for me. None of it is very graphic, but it is all VERY plainly stated. I keep thinking I should try this one again, because it has all the elements of a story I would really love...but I didn't. Perhaps someday! I loved this one, too. I don't remember there being a lot of sexual content, but then again I read romances on the regular, so... yeah. *grin* I really need to pick up the second book! Lol "worm demons." Good to know! 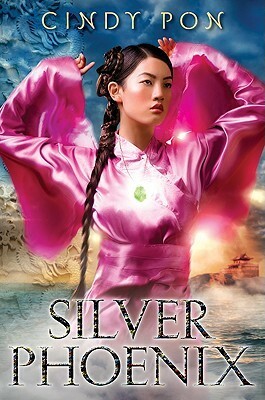 Honestly this is the first review we've read for SILVER PHOENIX -- besides hearing some good general buzz on Twitter and such -- so we really enjoyed it. You've pretty much convinced us to read this. Thanks for sharing your thoughts! Woo hoo! It makes me sad that these books haven't got more attention. I'm so happy to see your review, hopefully it will get more excited to read them. I think she could have explored things more, but I kind of liked keeping things fast. I don't really remember the sexual content but its been quite awhile since I have read it. So glad you loved it! And thanks for the link love!